Embark on an enchanting expedition through New Zealand’s North and South. This Inspiring Journey provides the perfect balance of relaxation and adventure, from the hot pools of Franz Josef to the brave depths of Queenstown, the adventure capital. Explore extraordinary landscapes and the age-old legends of the Māori as you come face to face with exhilarating New Zealand as few have seen it before. Stunning Milford Sound in the heart of Fiordland National Park. New Zealand’s capital Wellington. Experience Franz Josef Glacier. Journey on the iconic TranzAlpine Train. Historic goldrush Arrowtown. Visit a jade factory and see artists at work. Experience the Redwoods Treewalk. Gain an insight into Māori life at Whakarewarewa Living Village. Cruise in the Bay of Islands. Stay in chalets and cruise on sparkling Milford Sound. 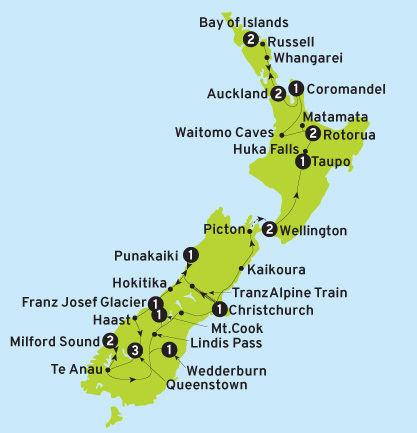 21 night The Long White Cloud tour including accommodation, luxury coach, airport transfers, daily breakfast, 1 lunch & 15 dinners. Journey on the iconic TranzAlpine Train. Gain an insight into Māori life at Whakarewarewa Living Village. Cruise in the Bay of Islands. Stay in chalets and cruise on sparkling Milford Sound.